WHAT: The University of Illinois Springfield will hold its 2nd annual research symposium for the Arts, Humanities and Social Sciences. WHEN: Friday, April 8, 2011 from 9:30 a.m. to 5 p.m. DETAILS: The event, which will feature student oral presentations, is free and open to the public to attend. Refreshments will be provided. The keynote presenter will be Dr. Lan Dong, assistant professor of English. Her lecture is entitled "‘Everybody is Kung Fu Fighting? :’ Mulan’s Cross-Cultural Journey in Literature and Media,” and is based on her recently published book Mulan’s Legend and Legacy in China and the United States (Temple, 2010). This event showcases research and writing projects of UIS undergraduate and graduate students across disciplinary lines in the Arts, Humanities, and Social Sciences. Presentations will cover a variety of topics, such as gender norms in Iraq and Afghanistan, the presidential rhetoric of LBJ, and the works of Alfred Hitchcock. The intent is to share the rewards of original research with students and faculty, as well as with Springfield and surrounding area communities. For more information, contact Amanda Dahlquist at 217/ 206-7459 or email adahlq2@uis.edu. 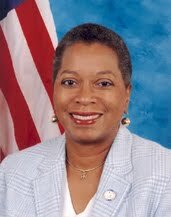 Congresswoman Donna M. Christensen, delegate from the U.S. Virgin Islands, met with students at the University of Illinois Springfield before delivering a keynote address on issues of race, class and ethics in health care on March 28, 2011. “It’s amazing that in 2011 we still have people of color and rural residents dying from preventable causes and high numbers,” said Christensen. Christensen is the first female physician in the history of the U.S. Congress, the first woman to represent an offshore territory, and the first woman delegate from the U.S. Virgin Islands. “It shows me there is no limits. 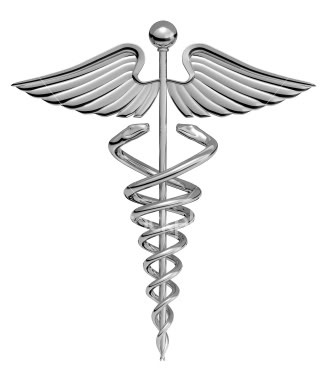 I can become a physician (an anesthesiologist). I can also be in congress,” said Jinger Sanders, sophomore biology major. “I think it’s a big issue for all of us, because it affects everybody. Whether you are young, old, black, white. It doesn’t matter, everyone needs health care at some point,” said Ryan Roth, senior political science major. Christensen says she enjoys traveling and meeting with college students. She takes the concerns and ideas expressed by the people she talks to back to Washington. “It was awesome that she was able to come here. I don’t know where else I would have the opportunity to meet with a U.S. congressman from the Virgin Islands,” said Matt Van Vossen, senior political science major. UIS, the SIU School of Medicine, and the Illinois Humanities Council sponsored the congresswoman’s visit. WHAT: The University of Illinois Springfield Engaged Citizenship Common Experience (ECCE) Speakers Series presents “An Era of Post-Racial Equality.” This event will feature Tim Wise, a prominent anti-racist writer and educator, who is known internationally for his efforts. WHEN: Wednesday, April 6, 2011 at 7 p.m.
WHERE: Brookens Auditorium, located on the lower level of Brookens Library, with overflow seating available in conference rooms PAC C/D. DETAILS: Wise, who was recently named one of “25 Visionaries Who are Changing Your World” by Utne Reader, has spoken in 49 states, on over 600 college campuses, and to community groups across the nation. He has also lectured internationally in Canada and Bermuda on issues of comparative racism, race and education, racism and religion, and racism in the labor market. He has been called, “One of the most brilliant, articulate and courageous critics of white privilege in the nation,” by best-selling author and professor Michael Eric Dyson of Georgetown University. Wise has provided anti-racism training to teachers nationwide and has conducted trainings with physicians and medical industry professionals on how to combat racial inequities in health care. He has also trained corporate, government, entertainment, military and law enforcement officials on methods for dismantling racism in their institutions and has served as a consultant for plaintiffs’ attorneys in federal discrimination cases in New York and Washington State. 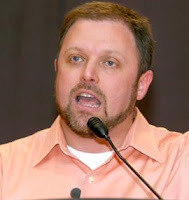 For more information, visit Wise’s website at www.timwise.org. This event is co-sponsored by UIS Student Affairs’ Speakers’ Awards Committee; the UIS Diversity Center; the UIS College of Public Affairs & Administration; the UIS College of Liberal Arts & Sciences; the UIS College of Business Management; the UIS College of Education & Human Services; and the UIS Chancellor’s and Provost’s offices. For more information and a list of other Speakers Series events, visit http://illinois.edu/goto/speakerseries or contact Kimberly Craig at 217/206-6245 or craig.kimberly@uis.edu. WHAT: University of Illinois Springfield Engaged Citizenship Common Experience (ECCE) Speakers Series presents Healthcare: Reform and its Impact on College Health Programs and Students. The featured speaker for this event is James Mitchell, director of Student Health Service at Montana State University in Bozeman, Mont. WHEN: Tuesday, April 5, 2011 at 4:30 p.m. DETAILS: Mitchell has been a spokesperson for the Lookout Mountain Group since 2009. The group is a non-partisan study group looking at the impact of healthcare reform on college health. He has also been a member of American College Health Association for more than 30 years. Mitchell will conduct an overview of legislation and its potential effect on college students; discuss relevant regulations that have been issued since passage of the Health Care Reform Act; describe how student insurance plans will be affected; discuss options for students to obtain insurance coverage; and review the impact of new legislation for on-campus primary care, counseling and health promotion programs. This event is being sponsored by UIS Campus Health Service, the Department of Recreational Sports, ECCE Speaker Series and the MPH Student Association. For more information contact Campus Health Service 217/206-6676 or email HealthService@uis.edu. The University of Illinois Springfield’s Alfred O. and Barbara Cordwell Therkildsen Field Station at Emiquon and its partners will host the third annual Midwest-Great Lakes Society of Ecological Restoration (SER) Chapter Meeting on April 1-3, 2011. The Midwest-Great Lakes Chapter was established as a SER Regional Chapter in March 2008. The Chapter serves Ohio, Indiana, Michigan, Illinois, Wisconsin and Minnesota. Under the leadership of Chapter President Rocky Smiley, Ph.D., the chapter is the largest restoration group in the Midwest and Great Lakes region. The meeting theme this year is “Linkages between Ecological Restoration and Ecosystem Sustainability”. Participants will examine how current restoration efforts contribute to regaining, preserving, and sustaining the structure and functions of Midwestern and Great Lakes ecosystems. The meeting will begin on campus, but also features off site tours of UIS’ field station and other sites. The meeting begins on campus at the Public Affairs Center on Friday, April 1 with registration starting at 11 a.m. Registration is followed by a special plenary session on floodplain restoration for sustaining large river ecosystems that is organized by Michael Lemke, UIS associate professor of Biology and director of the Therkildsen Field Station at Emiquon. A keynote presentation will be delivered later that evening by Roger Anderson, emeritus professor of Ecology at Illinois State University. Over forty contributed presentations will be given by presenters from nine states including Illinois, Indiana, Iowa, Kansas, Michigan, Minnesota, Missouri, Ohio, and Wisconsin on both Friday afternoon and Saturday (April 2) morning. Ecological restoration work at the Emiquon Preserve will be the focus on the afternoon of Saturday, April 2 when meeting participants will have the option to board a bus and tour the Emiquon Preserve, located 45 miles from campus. 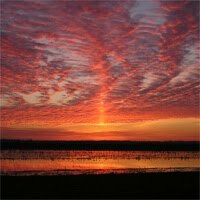 In 2007, The Nature Conservancy began transforming 7,425 acres of farmland immediately adjacent to the Illinois River to its natural state - a large river floodplain. This undertaking represents one of the largest river reclamation efforts of its kind in the United States. The UIS Therkildsen Field Station at Emiquon was dedicated on April 25, 2008 to study, research, and document the incredible transformation and to give students the opportunity to learn at the site. Participants will have the choice of one of two field trips on Sunday, April 3. One field trip is a tour of The Nature Conservancy’s landscape scale restoration project at Kankakee Sands, located in northwest Indiana. The other field trip is a tour of Lincoln Memorial Gardens, located at 2301 East Lake Shore Drive in Springfield. For more information on the meeting, contact Michael Lemke at 217/206-7339 or email lemke.michael@uis.edu. You may also contact Michael Cheney at 217/206-8271 or email mchen1@uis.edu. Learn more about the Therkildsen Field Station at Emiquon by visiting www.uis.edu/emiquon/. More information on the Midwest-Great Lakes SER Chapter is available at http://www.ser.org/content/SERMWGL.asp. 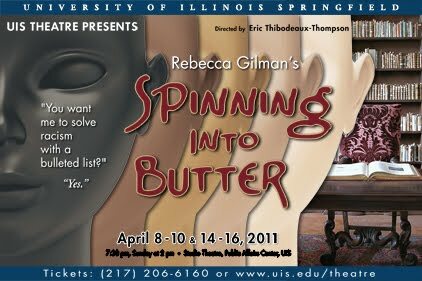 The Theatre Program at the University of Illinois Springfield will debut its second production of the 2010-11 season with the play Spinning Into Butter by Rebecca Gilman, opening Friday, April 8. Six performances will be presented in the Studio Theatre, on the lower level of the Public Affairs Center at UIS - on Friday, Saturday, Sunday, April 8, 9, and 10, and Thursday, Friday, Saturday, April 14, 15, and 16. All shows will begin at 7:30 p.m. except the Sunday performance (April 10), which will begin at 2 p.m. Seven actors/actresses are playing various roles in the production. The cast includes UIS alumnus Roger Boyd playing the role of Ross Collins, UIS student Tommy Caldwell playing Patrick Chibas, community member Tom Hutchison as Mr. Meyers, student Lindsey Ninmer as Sarah Daniels, community member Patrick O'Brien as Dean Burton Strauss, community member Linda Schneider as Dean Kenney, and student Ben Voloshin as Greg Sullivan. UIS Associate Professor of Theatre Eric Thibodeaux-Thompson directs Chicago playwright Rebecca Gillman’s provocative and challenging play. Crew members include UIS students Megan Johannsen, Sarah Steinhour, John Aten, Duran Simmons, and Emily Watts. Alumnus Chris Ray, staff member Wes Abbott, and faculty member Kate Goodman are also assisting. For more information about this year's UIS Theatre season, contact Eric Thibodeaux-Thompson at 217/206-6613 or email ethib1@uis.edu. WHAT: The University of Illinois Springfield Chorus, directed by Melinda Pitt Kaye and assisted on piano by Pamela Scott will perform a free concert. WHEN: Friday, April 1, 2011 at 7:30 p.m. 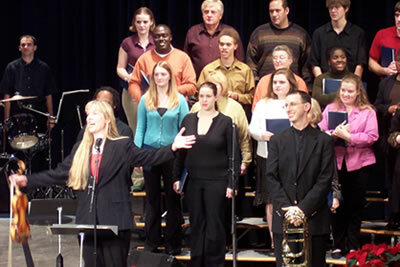 DETAILS: The UIS Chorus includes students enrolled at UIS, faculty, staff, alumni and community members. The concert will include a wide variety of music styles including selections from Ariel Ramirez’ Missa Criolla, an Argentine folk mass featuring Latin percussion, guitar and string bass. Pop songs include Toto’s Africa, the Chordette’s Mr. Sandman and the Ink Spots’ Java Jive will also be featured in addition to more traditional choral pieces including ‘Til Time and Times Are Done with music by Ron Kean and text by Williams Butler Yeats. Poetry by another Irish author, James Joyce will also be performed in a set by Italian Composer, Roberto Di Marino. The UIS Chorus will also perform a 45 minute program on Saturday, April 9 at 2 p.m. at the Vachel Lindsey Home State Historical Site located at 603 S. Fifth Street in Springfield and at the UIS Music Showcase on Friday, May 6 at 7:30 pm in the Sangamon Auditorium. Information about all UIS Music performances and events can be found at www.uis.edu/music. For more information, email music@uis.edu or call 217/206-6240. 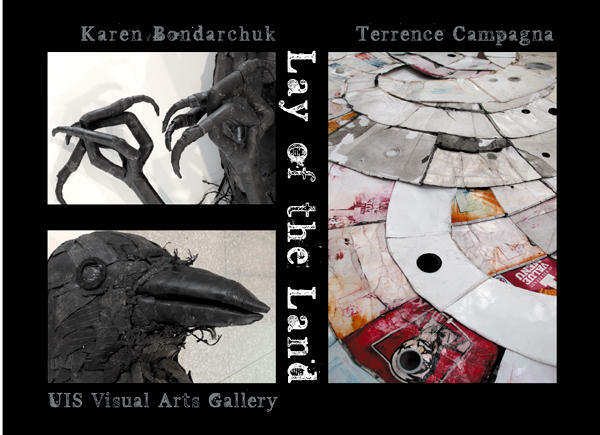 Lay of the Land, an exhibition of work by artists Karen Bondarchuk and Terrence Campagna opens at the University of Illinois Springfield Visual Arts Gallery on March 31 and closes with a reception on April 22 (Earth Day) from 5:30-8 p.m. The reception and exhibit are free and open to the public. The two artists create works from found and discarded materials that questions the relationship between production and consumption in contemporary society. Bondarchuk and Campagna were co-winners of last year’s (2010) Sustain international juried exhibition at the UIS Visual Arts Gallery, and were awarded a two-person show by a guest juror, environmental activist and author Terry Tempest Williams. The Sustain show featured works by 13 artists addressing three vital components of sustainability: resource conservation, social justice, and economic equity. The gallery is pleased to present a more comprehensive exhibition of these two innovative artists’ ideas, and to consider any new relationships that may arise between their similarly motivated, but very different works of art. Artists Karen Bondarchuk and Terrence Campagna give a new and resonant life to mundane, seemingly dead materials that our culture produces, uses, and finally abandons. Bondarchuk's process begins by scavenging for materials along the shoulders of interstate highways while Campagna makes his collections anywhere from roadways and railroad tracks to city streets and parking lots. The materials that both artists gather from the land reference our industrial “on the go” culture—blown out truck and car tires, fast food packaging, disposable containers, among other everyday bits and pieces. These artists explore the places where most of us feel urged to quickly pass through (highways, streets, parking lots, etc). Inspired by both the throwaway materials and the largely uninhabitable spaces in which they are found, Bondarchuk and Campagna create objects that awaken our capacity for contemplation as well as our desire to care for and make sense of the world around us. WHAT: The Political Art and the Public Sphere (PAPS) series at the University of Illinois Springfield presents a screening of the film Cuba: The Accidental Revolution. The film will be followed by a discussion moderated by Stefano Longo, assistant professor of Environmental Studies at UIS. WHEN: Monday, March 28, 2011 at 6 p.m. 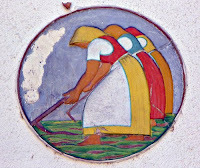 DETAILS: At one time Cuba’s agrarian culture was as conventional as the rest of the world. It experienced its first “Green Revolution” when Russia was supplying Cuba with chemical and mechanical “inputs.” However, the collapse of the Soviet Union in 1989 ended all of that, and almost overnight threw Cuba’s whole economic system into crisis. Factories closed, food supplies plummeted. Within a year the country had lost over 80% of its foreign trade. Cuba was unable to feed its population and the country was thrown into crisis. Without fertilizer and pesticides, Cubans turned to organic methods. Without fuel and machinery parts, Cubans turned to oxen. Without fuel to transport food, Cubans started to grow food in the cities where it is consumed. Urban gardens were established in vacant lots, school playgrounds, patios and back yards. As a result Cuba created the largest program in sustainable agriculture ever undertaken. Stefano Longo will guest moderate each session in the spring 2011 semester. Longo, who helped to curate the program for the spring 2011 series, earned his Ph.D. in Sociology at the University of Oregon in 2009. His expertise is in the areas of environmental sociology, political economy, and social theory. His research focuses on the global food system, examining the intersection of environmental and social processes in the context of food production, consumption, and distribution. The PAPS series is a monthly event on the UIS campus featuring a showing or a performance of some kind of “political art,” followed by an hour or two of group discussion. Each of the installments in the spring 2011 series will provide a look at critical perspectives on ecology and environmental crisis. Speakers Series presents "American Indians in U.S. Law: Racial Discourses of the Nation State"
WHAT: The University of Illinois Springfield Engaged Citizenship Common Experience (ECCE) Speakers Series presents “American Indians in U.S. Law: Racial Discourses of the Nation State”. The presentation and discussion will be led by Kim Benita Vera, assistant professor of Legal Studies at UIS and the Institute for Legal, Legislative and Policy Studies. WHEN: Tuesday, March 29, 2011 at 7 p.m. DETAILS: The presentation will feature a brief overview of the history of “federal Indian law,” the body of law that U.S. institutions created to govern American Indian affairs. Although they are sometimes called “the First Americans,” American Indians were not legally deemed U.S. citizens (with just a few exceptions) until the late date of 1924. In much of the history of U.S. law, Indians have been conceived as subjects outside of American nationhood by virtue of being racially different. Focusing on selected cases and other legal texts, this talk will examine conceptions of racial otherness, humanness, and citizenship in the formative period of federal Indian law. The racial discourses of federal Indian law do not only tell us about American Indians. They reveal how notions of the “American self” have been defined in contrast to those regarded as beyond the boundaries of American nationhood and citizenship. Vera received her J.D. and Ph.D. in the College of Law and the School of Justice Studies at Arizona State University in 2006. 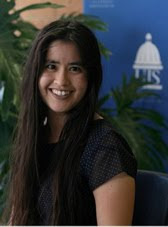 She joined the faculty at UIS after serving as Chancellor’s Postdoctoral Fellow in American Indian Studies at the University of Illinois at Urbana-Champaign. The University of Illinois Springfield’s popular Friday Night Star Parties will resume the last week in March and continue through the end of April. Those dates include: March 25 and April 1, 8, 15, 22, and 29. Friday Night Star Parties are held from 8 to 10 p.m. (weather permitting) at the UIS observatory, located on the roof of Brookens Library. 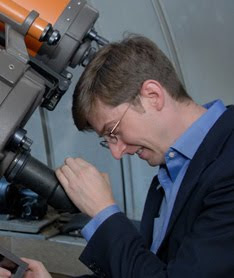 Star Parties are hosted by John Martin, assistant professor of Astronomy/Physics. The observatory’s telescopes will be used to view a number of celestial objects, including the planet Saturn; the Moon, when visible; the Great Nebula in Orion; and other double stars and star clusters. A typical Star Party begins with a presentation as visitors ascend the stairs to the observatory, learning about galaxies, the sun and stars along the way. On the roof observation deck visitors are invited to view various celestial objects through telescopes and ask questions. Participants are welcome to arrive and leave as they wish between 8 and 10 p.m.
Friday Night Star Parties are free and open to the public. Reservations are not required, and groups are encouraged to attend. The entrance to the campus observatory is located outside Brookens Library on the southeast corner of the building. Star Parties may be canceled due to cloudy weather. Questions about whether the weather is suitable for viewing should be directed to 217/206-8342 at 7 p.m. on the evening of the Star Party. For more information on Star Parties, email John Martin at jmart5@uis.edu or visit www.uis.edu/astronomy/about/starparties.html. WHAT: The University of Illinois Springfield and the Southern Illinois University School of Medicine are pleased to announce that Congresswoman Donna M. Christensen, delegate from the U.S. Virgin Islands, will deliver an address on issues of race, class and ethics in today’s health care. Her appearance is also sponsored by the Illinois Humanities Council. WHEN: Monday, March 28 at 7 p.m. DETAILS: The Honorable Donna M. Christensen is serving her seventh term in the United States Congress. She is the first female physician in the history of the U.S. Congress, the first woman to represent an offshore territory, and the first woman delegate from the U.S. Virgin Islands. Congresswoman Christensen serves on a number of Congressional committees, including Energy and Commerce and its Subcommittee on Health, Telecommunications and the Internet; Natural Resources and its subcommittee on Insular Affairs, Oceans and Wildlife and subcommittee on National Parks, Forests and Public Lands. Delegate Christensen is the chair of the Congressional Black Caucus Health Braintrust, which oversees and advocates minority health issues nationally and internationally. Congresswoman Christensen has been quoted as saying, “Health care is the civil rights issue of the 21st century.” In her talk in Springfield, Congresswoman Christensen will offer the reasons that she believes that health care is such an important issue for America now, exploring how race and/or social class may limit access to health care. The congresswoman’s speech will be preceded at 6 p.m. by a reception at the Pearson Museum across the hall from the auditorium. Both events are free and open to the public. Parking is available in the SIU lot on the north side of the 801 Building. The Pearson Museum and the South Auditorium are located on the second floor of the building. The evening with Congresswoman Christensen is sponsored by the Friends of Brookens Library at the University of Illinois Springfield, the Southern Illinois University School of Medicine, and the Illinois Humanities Council. For more information on the appearance, contact Dean Jane Treadwell at 217/206-6597 or email jtrea1@uis.edu. Cyber Defense and Disaster Recovery Conference explores "Securing the Human"
“Securing the Human” was the focus of the 2011 Cyber Defense and Disaster Recovery Conference at the University of Illinois Springfield on March 11, 2011. The one-day training conference was organized by the UIS Computer Science Department, in conjunction with InfraGard Springfield, an initiative of the FBI, and CSSIA, a regional center for cyber security. “Securing the Human is protecting them from disasters that they can get themselves into by giving out information they shouldn’t,” said Ted Mims, chair of the UIS Computer Science Department. More than 200 people attended the conference, which included speakers from around the country talking about topics, such as “Using the Internet to Discover Personal Information” and “Securing Access to Applications and Social Media”. “It’s an extremely important topic in cyber security and physical security. It’s probably our greatest weakness,” said Daniel Hancock, a senior Computer Science major who helped organize the conference. Hancock says the conference is not only a chance for students like him to learn about the latest threats, but build connections with people in the industry. “It presents a good networking opportunity to be able to get with them and discuss recent security trends,” said Hancock. Conference participants were made up of law enforcement personnel, members of state agencies, as well as representatives from the public and private sector. “It’s really a program about leadership more than anything, but they come together in this team effort to craft a solution that meets this need,” said Anne Craig, director of the Illinois State Library. UIS has hosted the event before and the university also has a number of librarians who have taken part in the initiative. Four staff members from Brookens Library participated last year and visiting instructional librarian Sarah Sagmoen was selected to serve as an instructor this year. “We have a lot of things to show off and we get a chance to say what we’re doing and then people can take that back to their libraries and see if it will work for them,” said Sagmoen. University Librarian and Dean Jane Treadwell says the experience the UIS librarians gain from the initiative is invaluable. “I think it’s wonderful to be able to work with the state library and to capitalize on the fact that we’re both in the state capitol here. It’s a really good partnership,” said Treadwell.